When? 1988 | Where? DVD. Paris of the 1920s is indelibly romanticized thanks to Ernest Hemingway’s The Sun Also Rises and A Moveable Feast, and the famed author, bon vivant, and macho man—played here by Kevin J. O’Connor—makes an appearance in this award-winning 1988 film about American expatriate artist Nick Hart (Keith Carradine), who’s struggling to gain a foothold in the creatively fertile but highly competitive Parisian art scene. The heart of the story is about his struggle to gain legitimacy as an artist and his estranged relationship with his wife Rachel (Linda Fiorentino), who shows up back in his life now “married” to a sadistic and violent rich American businessman named Bertram Stone (John Lone), who doesn’t realize his wife is still legally married to Hart. 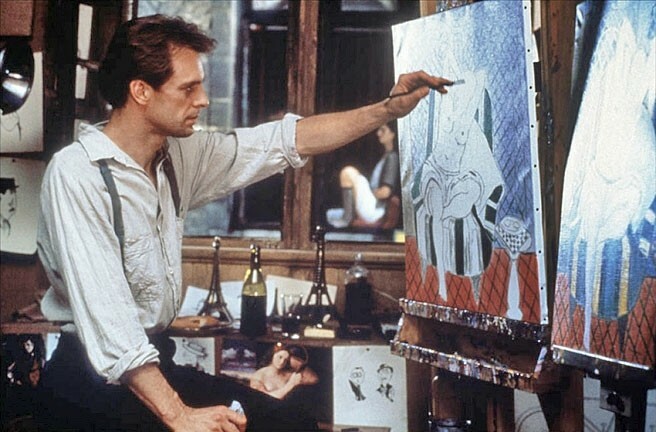 ARTIST OR MERE FORGER: Nick Hart (Keith Carradine) is an American expatriate artist living in 1926 Paris, who's still in love with his estranged wife though she's now "married" to a jealous and sadistic rich businessman. Though a gifted artist trying to make a name for himself in the Post-Impressionistic Modern art era, Hart’s work can’t compete with artists such as Picasso, Modigliani, or Chagall. He sustains himself by drawing street caricatures and tries to sell his original paintings in sympathetic art gallery owner Libby Valentine’s (Genevieve Bujold) shop, but with little success. He is, however, an excellent forger of other more popular artists’ work, and Hart is recruited to forge art from the collection of wealthy divorcee Nathalie de Ville (Geraldine Chaplin), in a scam to cheat her ex-husband. She keeps the originals and sells some of the forgeries as the real thing to rich assholes like Bertram Stone. The film does a great job of recreating the café society of the 1920s, where drinking and socializing were at the heart of the art scene, which in this case is lorded over by Gertrude Stein (Elsa Raven) and her lover Alice B. Toklas (Ali Giron). Pretentiousness and egos and alcoholism collide in a delightful way. It’s also worth mentioning that the great Wallace Shawn stars as Oiseau, Hart’s bestie, and Shawn is wonderfully caustic and deadpan, as usual. There are also some great bar scenes with pianist-singer Charlélie Couture, and the film’s soundtrack by Mark Isham seems to embody the period in a remarkably gorgeous way. The film itself is filled with amazing costumes, sets, and locations, all lovingly shot by director of photography Toyomichi Kurita under the helm of director-cowriter Alan Rudolph (Choose Me, Trouble in Mind, Mrs. Parker and the Vicious Circle, Afterglow).